The Feast of the Dioskouroi - An Excerpt from "A Heroic King"
We know very little about Spartan religious festivals -- except that they were taken seriously. 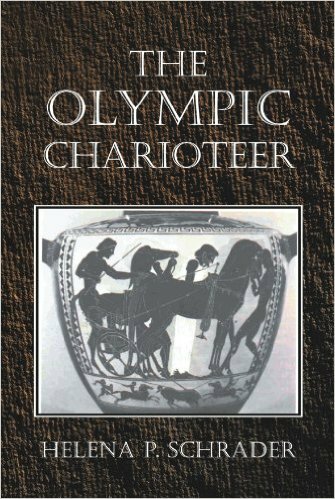 We also know they were marked by choral and dance performances, by sports contests including chariot racing in which women drivers could participate, and sacrifices to the gods. In the following excerpt from "A heroic King" I have tried to construct a Spartan festival based on these fragments of information. In the novel this festival is being celebrated after a devastating epidemic has killed hundreds of school children and the city is only slowly recovering as the epidemic has burned itself out. 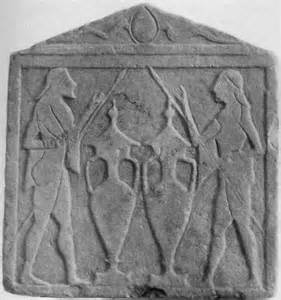 The Feast of the Dioskouria, in honor of the Divine Twins was one of Sparta's most sacred holidays. However, because it fell after the autumn equinox, when travel was uncertain, it was not well-known outside of Lacedaemon and rarely attended by strangers. In consequence, it was more a domestic festival than the Hyacinthia, the Karneia, and the Gymnpaedia, but no less important in Spartan eyes. The Dioskouria traditionally followed the end of the Phouxir, and was an opportunity to celbrate the successful graduation of a class of little boys to the status of youths. It also anticipated the winter solstice, when a class of eirenes would graduate to citizen status. The five day holiday celebrated the important deeds of the Divine Twins and culminated in a torchlight sacrifice at Kastor's Tomb, conducted by the reigning kings. Events included singing and dancing to mark the birth of the twins and their sister Helen, equestrian events in honor of Kastor, boxing to honor Polydeukes, and a day-long boar hunt culminating in an outdoor feast on the banks of the Eurotas. Throughout the holiday, special pear pastries and pear cider were consumed in large quantities. All in all, the Dioskouria was one of the Sparta's most pleasant festivals. The third day of the Dioskouria commemorated the participation of the Dioskouroi in Herakles' hunt of the dangerous Kalydonian boar. The central event was a boar hunt led by the kings and guard, in which (theoretically) every able-bodied Spartan male participated. As citizen numbers had grown over the years, however, such a hunting party became unwieldy. Nowadays, many citizens, particularly the older men who felt they couldn't keep up with the Guard, went off in small groups to hunt on their own. The objective was to bring in as much game as possible to lay on the altar of the Divine Twins. After the hearts and livers of the game had been given to the Divine Twins, what was left of the carcasses was taken down to the Eurotas and the meat roasted over open fires for a collective feast. 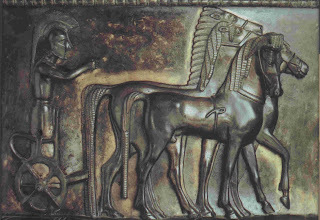 The equestrian events on the fourth day of the Dioskouria included horse and chariot racing. 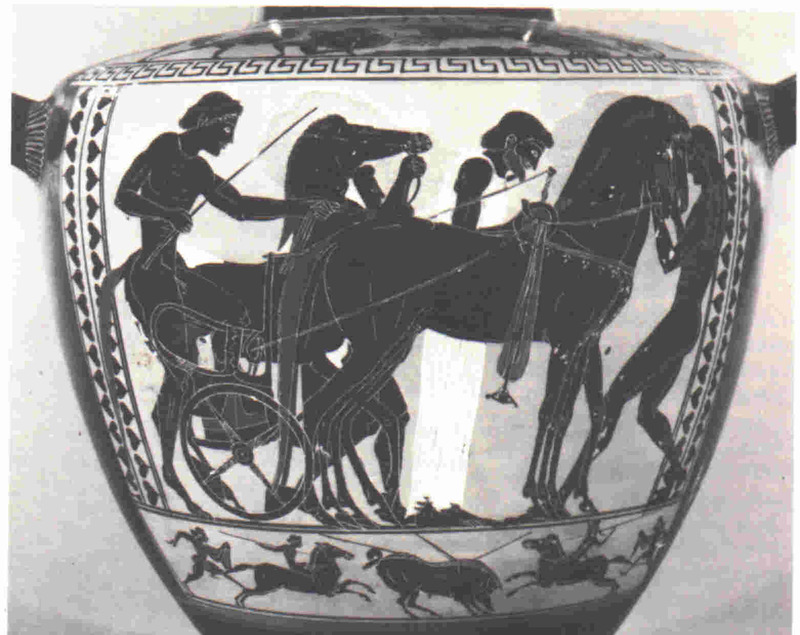 One of the favorite events was a two-horse chariot race in which Spartan maidens drove light chariots in competition. Over the years it had become customary for the sweethearts of the maiden charioteers to gallop alongside their favorite's team, cheering and urging on the horses. Gorgo had hated the event because she didn't have a sweetheart, and though she was sure she could have won the race itself, she was ashamed to advertise her lack of popularity by competing. The [final] choral performance struck a chord with the audience in a rare way. Somehow Euryleon had put together a program that acknowledged and honored the dead, but at the same time focused on new life. The story of Kastor was well suited to that, of course, and yet not every choral master could have pulled it off. The audience was given a chance to mourn, and Leonidas heard more than one person sobbing in the darkness behind him. Even Gorgo clutched his hand more tightly and dabbed at her eyes with her other. But then the maiden chorus came down the aisles of the amphitheater, singing lyrics about Helen guided home from Troy by the stars of her brothers in the night sky. Each girl was carrying an oil lamp and when they met in the center of the stage, they joined their lamps together to light a larger fire. They formed a circle and started to dance around it, soon joined by young men. The song was joyous, and the dancers, followed by the audience, started to clap in time. At the end, the audience broke out into thunderous applause. Gorgo leaned to her husband to shout in his ear over the cheering, "Do you think they really have anything in Athens that can beat that?" Labels: Dioskouroi, Spartan festivals, Spartan piety, Spartan religion. Historical fiction. There have been persistent attempts to find evidence of a helot revolt, for example, and W. P. Wallace (“Kleomenes, Marathon, the Helots, and Arkadia,” The Journal of Hellenic Studies, Vol. 74 (1954), pp. 32-35) came up with a theory of Arkadian discontent and intrigues. I myself have suggested a command crisis, which I explained in detail in my blog entry on Sparta and Marathon. Yet the bottom line is that all these theories are essentially the product of dissatisfaction with the notion of a religious festival. However, we ought to admit to ourselves that we know very little about Spartan religious festivals. Most especially, we do not how they affected the readiness of the Spartan army. The assumption that a religious festival might delay departure of the army simply because of pious scruples may be entirely wrong. What if, for example, the Spartan Army was given leave during religious festivals, or reduced to a skeleton of “duty officers” for each unit? Such a procedure would be perfectly normal in most societies because religious festivals, in all cultures over all times, are fundamentally family occasions. Why should Sparta have been any different? 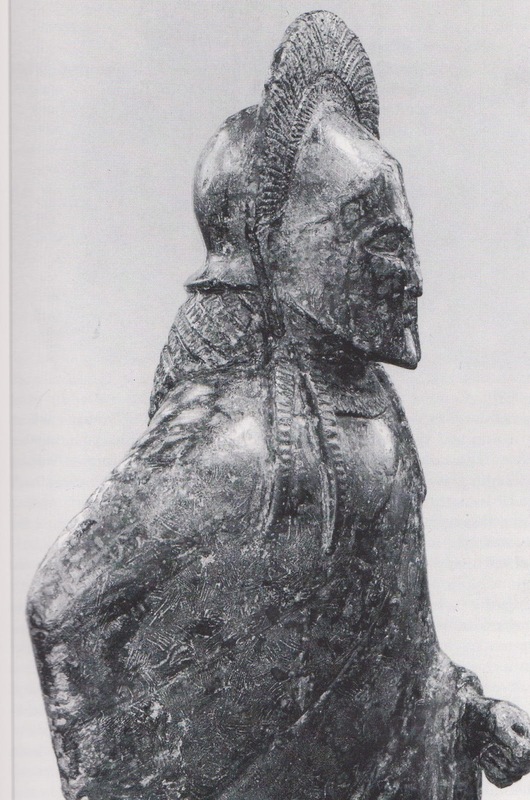 The very fact that there is no mention of how “odd” the Spartans were in this regard suggests that their behavior conformed to that of other Greeks and so elicited no comment. If, as elsewhere, religious holidays in Sparta were celebrated in the family, then most likely the young men were exempt from sleeping in barracks and all men exempt from dining at their messes. Again, the fact that this is not explicitly mentioned is no evidence that it was not the case. 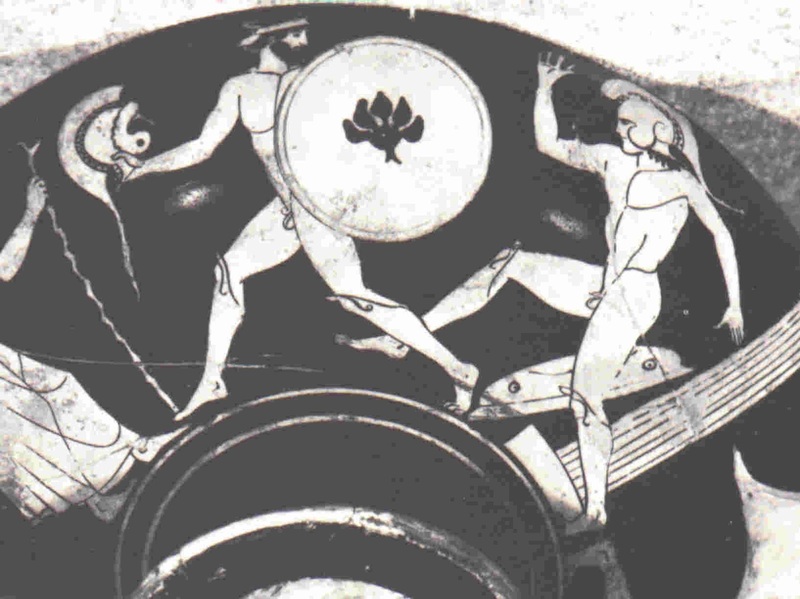 There is no mention of men being exempt from duty and collective dining to participate in the Olympic Games either, but Spartan athletes were very prominent at the Olympics and they had to train in Elis for a month before the events just like all the other competitors. Likewise, Spartan spectators at the Games could not be eating and sleeping in Sparta while they were at Olympia. In short, the rules about living in barracks and eating at the messes were for “ordinary” days. The Olympics, war, and, arguably, religious festivals were “extraordinary” or “exceptional” days. We know, further, that Spartans all had at least a state kleros, while wealthier Spartans had more extensive estates. Without knowing the yield of an acre of land using contemporary agricultural methods, I have no way of estimating just how large a kleros would have been, and without know how large each kleros was, I cannot estimate how many could have been located within easy walking/riding distance of Sparta’s barracks and messes. However, I think it is fair to say that not all 8,000 – 9,000 kleroi could have been within easy reach of the heart of Sparta. It is far more likely, that many kleroi were more than a half-day away from Sparta. Some may even have been located in Messenia, on the far side of Taygetos, or on Kythera. Reaching these estates to check up on things and to collect rents would have taken Spartans away from Sparta for days on end. The requirement to be present in Sparta most of the time, meant that most of the time the estates were left in the hands of helots, perioikoi overseers or wives. Yet the fact that Spartiates were absent from their estates most of the time only reinforces the need for them to be present some of the time. Particularly if Spartiate/Helot relations were as bad as most commentators suggest, no Spartan would have risked leaving his kleros entirely in the hands of his helots or even perioikoi overseers. It would have been essential for every Spartiate to periodically check up on things at his kleros or risk having it so mismanaged that he could not meet his syssitia (and, if he had sons, agoge) fees. If a kleros was left to a wife, the desire to visit periodically would have been even greater, particularly if she had the couple’s young children with her. In short, Spariates would have periodically traveled to their distant kleroi and while doing so they would have been excused both from their military duties and exempted from eating at their syssitia. Probably, any man could apply for leave to go to his estates whenever he felt it necessary. Possibly, it was traditional for men to go to their estates during holidays, when men were given leave to be with their families in any case. For the wealthier Spartiates from the so-called “better” families, the 400-500 families that made up Sparta’s elite, the need to visit estates would have been even more acute than for the poorest with only one kleros. The elite would have had multiple estates to look after, not to mention horse-farms, kennels, orchards etc. They would have needed to be away from Sparta more often than the others as a result. And it was this elite that, at least in the later years of the 5th century BC, occupied most of the positions of authority and power in the Spartan state. So if I am right and many citizens spent major (particularly long) holidays like the Karneia at their estates, then Pheidippides may have arrived in a Sparta when the army was dispersed and the commanders scattered about Lacedaemon on their distant estates. The ephors would have needed to recall at least the members of the Gerousia and the officers of the army as well as cancel leave for those units they wanted to send to Athens. The ephors could, I suspect, calculate pretty accurately how long it would take messengers to reach the lochagoi and other senior officers, and how long they would need to call up their troops and get them ready to march. That time frame alone – and nothing so impenetrable as piousness, helot revolts, foreign policy considerations, or even command uncertainties – might have determined the earliest possible day on which the Spartan army was able to march out for Marathon. In my novel, A Heroic King, I hypothesize an different reason for the delay, also plausible. 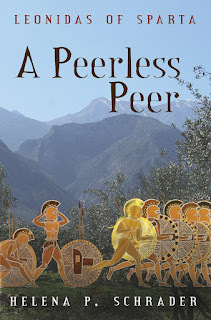 A Day at the Olympics -- An Excerpt from "A Peerless Peer"
At the start of the month I talked about Sparta's very successful athletes and Sparta's many victories in the Olympics. In this excerpt from "A Peerless Peer," Leonidas and his friends attend the Olympic games -- as spectators. The boxing was scheduled for immediately after the dolichos, the long-distance race in which the runners had to run twenty-four lengths of the stadium. It was always hard to guess how long the dolichos would last, and since it was a rather boring event, many spectators skipped it to secure better seats for the boxing. The bulk of the Spartan spectators chose this option, because they had no strong entrant in the dolichos but were hoping Cleombrotus would give them a victory in the boxing. Leonidas, however, declared his intention to go to the dolichos. "But if we go there, we'll never get a good seat for the boxing!" Sperchias protested. "Why should I fight half of Greece for a place from which to watch my brother beat someone up? I can see that in Sparta without any trouble any day of the week." Sperchias opened his mouth three times to find an answer, and finally settled on, "But the dolichos is so boring." "Not really. You go ahead to the boxing, if you like." Sperchias and Euryleon wordlessly followed Leonidas. They joined a small contingent of other Spartans, friends of the one Spartan competitor, Oliantus. No one really thought the young man, who was in the age-cohort ahead of Leonidas, had much of a changce against the Corinthian Aristeas or the Athenians, who were rumored to have not one but two outstanding runners, Pheidippides and Eukles. Leonidas and his friends made themselves comfortable partway down the slope beside the stadium. These were not the best seats, but their interest was only moderate. Below them was a large crowd of rowdy Athenians, who at the moment were divided into two factions that were shouting insults at one another. It was hard to hear exactly what was being said, but it sounded as if some of the men invented little rhyming ditties that made rude remarks about their rival. These brought roars of approving laughter from their own faction and counter-insults from the other faction. There was also a large Corinthian contingent, but this was more orderly, and the front-row seats near the finish line had been cordoned off. Only just before the start of the race did the men for whom these seats were reserved arrive in a small group, escorted by slaves. One man was even carried in on a litter, which the slaves set down so he could sit. The slaves then stood and held an awning over the spectators so they were shaded from the hot sun. Refreshments had evidently been brought as well. The cheers around them grew in intensity. The runners were on their twenty-second lap. Just two more turns. The Spartan seemed to be gaining on the leaders, and the Spartan spectators were standing and cheering him by name. "Oliantus! Oliantus!" Leonidas was gald for him. He was a quiet, rather ugly man who hardly ever drew attention to himself. 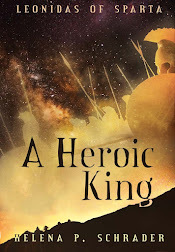 A conscientious soldier, Leonidas knew, who had been passed over for promotion every year. He felt it would only be fair if Oliantus won a surprise victory here -- and it served the rest of his countrymen right for preferring to secure seats for Brotus' fight rather than support the underdog. Last month I discussed the many public services Spartiates fulfilled, and noted that Spartan society wasn’t quite as simple as it is often made out to be. Continuing that theme, I'd like to look at two other areas of Spartan excellence: sports and art. 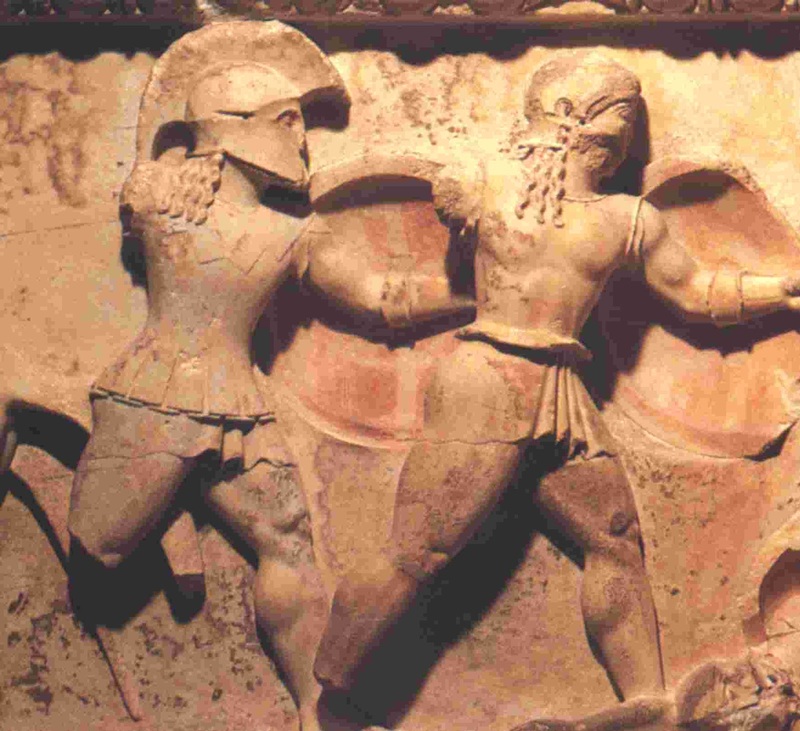 The Race "in armor" was an event in the Ancient Olympics that the Spartans generally won. The quality of Spartan athletes is attested by numerous Lacedaemonian victory dedications at the pan-hellenic sites. Stephen Hodkinson in his essay "An Agonistic Culture?" in Sparta: New Perspectives (Hodkinson, Stephen and Anton Powell, eds, Duckworth, 1999) records over 62 known Olympic victories by Spartans in the period from 720 - 304 BC. Olympia was only one of four sacred, pan-Hellenic games; there were also games held regularly at Delphi, the Isthmus of Corinth and Nemea. In order to compete abroad, Spartan athletes would have had to train, and compete, at home first. But sport helped maintain physical fitness and so could be considered training for soldiering. The evidence of Spartiate sculptors is therefore more surprising and intriguing. According to Conrad Stibbe in his excellent book Das Andere Sparta (Philipp von Zabern, 1996) no less than nine Lacedaemonian artists are known to have worked in Olympia alone. While the majority of these artists are described as Lacedaemonian, in two cases, Syadras and Chartas, the artists are explicitly referred to as Spartiate. While it is possible these were the only exceptions in Spartan history, it is more likely that they are the tip of the iceberg: the only surviving record over two and a half millennia of other nameless Spartiate artists. Arguably Sparta's most famous sculpture; dating from the early 5th century it is affectionately known as "Leonidas" -- although it is unlikely to actually depict him. Strikingly, Stibbe notes that the known Lacedaemonian artists worked for other states as well as Lacedaemon. That means they were recognized as outstanding artists and worked professionally on commission, not just as amateur artists adorning their own city’s monuments. Four of the nine were said to be students of a famous Cretan sculptor, and several of them engaged apprentices from other cities. Clearly, artistic work at Olympia was “international” not parochial. Stibbe also notes that the Lacedaemonian sculptors worked not only in stone but in wood, ivory, gold, and bronze. Ivory and gold were used predominantly to decorate wood and therefore even if fragments of ivory and gold are found it may be difficult, if not impossible, to reconstruct the total work of art. 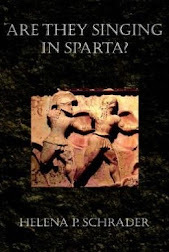 As so often when trying to understand Sparta and Spartan society, we are hampered by a paucity of archeological evidence that may reflect an absence of original material, destruction of the archeological record in earthquakes and flooding, or simply inadequate archeological investigation. 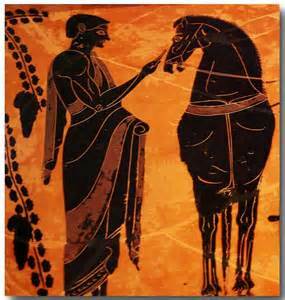 Troy, after all, was considered mythical or fictional for almost two thousand years, until one amateur fanatic revolutionized our understanding of the Mycenaean period by insisting on digging in a spot that was not previously investigated. 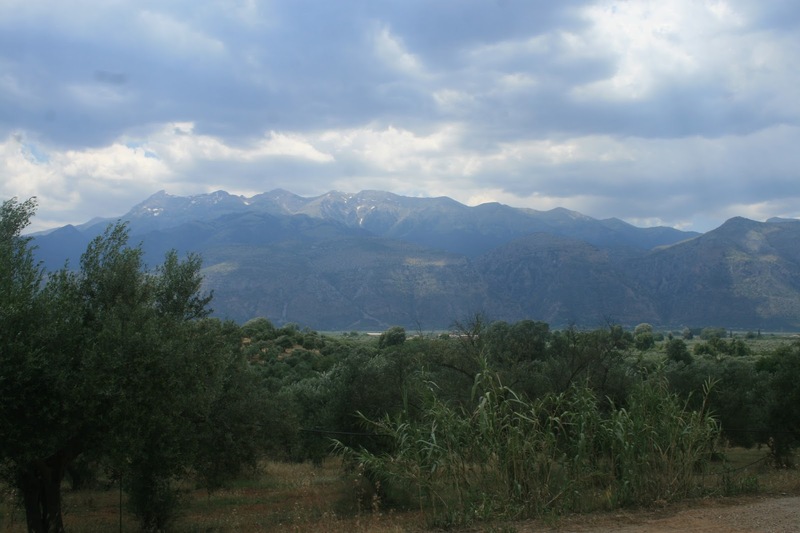 The site of Sparta itself may have been investigated, but much of Lacedaemon has never been systematically subjected to serious archeological study and new discoveries in Sparta’s “outlying” cities and temples may yet yield significant new finds. 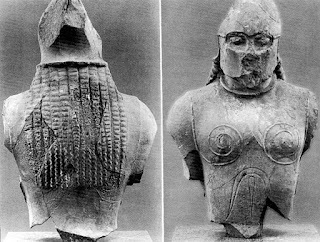 An example of this kind of discovery is a particularly beautiful stone sculpture found on Samos that appears to be of Lacedaemonian origin. It portrays a hoplite with long braids (as worn at this time exclusively in Sparta) and with breast-spirals on the breastplate (also typical of Laconian hoplites in art). Although not yet 100% confirmed, the marble also appears to be Laconian. If this statute was indeed Lacedaemonian, it would represent a significant discovery documenting more of Sparta’s almost forgotten artistic golden age. Meanwhile, we should not ignore the plethora of smaller art objects from bronze vessels and jewellery to statuettes and figurines found at Spartan sanctuaries which record a thriving industry for domestic craftsmanship if not high art. These are well catalogued by Reinhard Foertsch in his article "Spartan Art: It's Many Deaths," in Sparta in Laconia: Proceedings of the 19th British Museum Classical Colloquium, Dec. 1995 (Cavanagh, WG and S.E.C. Walker, eds.) 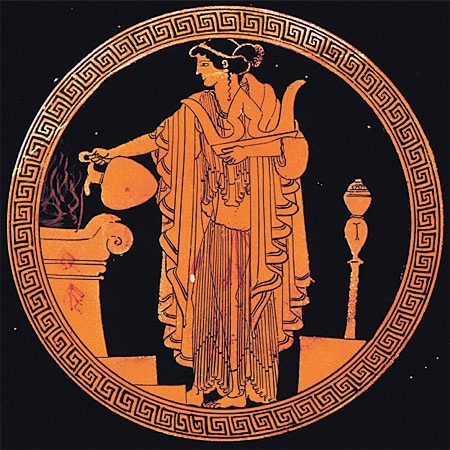 The same publication contains an excellent article by Maria Pipili, "Archaic Laconian Vase-Painting," which highlights the sophistication and high quality of 6th Century Laconian pottery. Altogether, archeological research suggests that art was more common and more valued in Sparta than is widely acknowledged today. Spartiates certainly bought works of art and dedicated art objects at their sanctuaries. The extent to which they engaged in production of art themselves will never be known but, as noted above with respect to the two sculptors, at least in some cases Spartans were professional artists. In all my novels set in Sparta I attempt to convey the complexity and sophistication that this fascinating society displayed. Graduation: An Excerpt from "A Peerless Peer"
Spartan life was marked by rituals of transition -- from boy to youth, from youth to manhood and military service, and from active service to "retirement." When men joined the reserves they were just 31 years old, however, and -- as I pointed out in the entry at the start of this month -- they had many options for pursuing a career in the administration of the Spartan state. In this excerpt from "A Peerless Peer," Leonidas and his friends have just turned over their shields to graduating eirenes, thereby symbolizing that they have left the active army, the life in the barracks, for the life of a "full-citizen," living on their estates and serving Sparta in other ways. The names were being read out. Gorgo watched her uncles turn over a shield to an eirene one after the other, still wishing she were out there in the square rather than wandering around on the fringes of the crowd feeling superfluous. She was so on the edge, in fact, that she did not even notice when the last name was read out. Suddenly everyone was cheering, and then the whole crowd burst out into the Ode to Kastor. Gorgo noted that an old man nearby was weeping openly, though she couldn't know why. Memories of his own youth? Joy for a son or grandson? Or mourning for a youth who hadn't made it? There were always one or two of those: boys who were killed in accidents, youths who committed serious breaches of the rules and were forced to repeat a year, and -- increasingly -- young men whose families could not pay their agoge fees and so were forced to drop out. The crowd was breaking up, dispersing. Younger boys were running to join their families, swept into the arms of mothers and sisters. Youths were going off in groups or swaggering proudly in front of younger siblings and admiring sisters. Young couples were disappearing around the corners into the darkness. Gorgo felt like going back to the palace and curling up in the straw beside her mare and hound, as she had done when she was a little girl. "Gorgo! What are you doing? Come here!" The voice cut through her misery, and she looked up to see her Uncle Leo waving to her. He was with his friends, of course, and he was smiling, even though his tone was admonishing. As she joined his little group, he put his arm around her and drew her into his circle, asking in a low voice, "Is something wrong? You look so unhappy?" "I'm just jealous," Gorgo admitted. "I wish girls got to go through the agoge and graduate like that in public." One of Leo's friends laughed outright, and another shook his head and remarked, "Believe me, it's not as fun as it looks!" But Uncle Leo seemed to understand. He said, "You're right. At least in other Greek cities girls are the center of attention at their weddings, but we don't ever celebrate you, do we?" "Better less celebration and more freedom," one of the women in the little crowd noted rather sharply. "Of course," the other woman agreed, then smiled at Gorgo and added, "but what would be wrong with both? I'm Hilaira, by the way," she introduced herself to Gorgo, and the others introduced themselves as well. Gorgo noted the names of Leonidas' friends Alkander and Sperchias and Euryleon. The latter suggested they go to the banks of the Eurotas, where the cattle had been roasting for hours, and join the feast. Since the other men were with their wives and Leo had none, Gorgo naturally fell in beside him. He chatted with her, asking about Jason and Shadow as if she were still a little girl, but that was better than being left out. She asked him, "What are you going to do now that you're in the reserves?" "I'm going to work in the agoge," Leo announced. "Leo! You can't do that to us!" Euryleon protested, stopping dead in his tracks and gaping at his enomotarch. "I can and I have. I informed Diodoros this morning." "Leo! You're mad!" Sperchias exclaimed. "Why? You want a career in civil administration or diplomacy, not the army! Why is wrong form me to want something similar?" "Because you're a good officer, Leo -- and an Agiad." "What does that have to do with anything? Kyranios himself said that war was the failure of diplomacy. You do a good job as a diplomat, Chi, an we won't need a strong army." "I'm not a diplomat yet, and the minute we lose the capacity to fight better than anyone else, the Messenians and Argives will crush us." "We'll have a strong army whether I'm in it or not. Now let's enjoy the food," Leonidas ordered, and the others knew better than to try to argue with him when he was in one of his mulish moods, as he obviously was. Gorgo wasn't sure what to think, except that she wanted her uncle to be happy. Maybe he was right and he would be happier outside the army, but only, she thought, if he could do good for Lacedaemon. Uncle Leo was more like her father than he -- or her father -- liked to admit. Behind his facade of humility, he was actually very ambitious. What was more, she realized with a kind of awed surprise -- even more than her father, he cared about Sparta, not just himself. In the 5th Century BC, Lacedaemon stretched from the Ionian to the Aegean Sea and had an estimated population of 60,000 or more. It had at least three classes of inhabitants (helots, perioikoi and Spartiates). It had a public school – unlike any other city of its age. It had a great number of public festivals with complex rituals involving choral, dance and athletic competitions. It successfully competed in the pan-hellenic games. It pursued extensive diplomacy throughout the then known world. And all this in addition to pursuing a brutal war that dragged out over generations in the second half of the fifth and early fourth century. In short, Sparta was a highly sophisticated society, which could not have been managed by two bickering kings, 28 men in their dotage and five amateurs elected for a single year. Sparta’s centuries of pre-eminence in the ancient world – and its reputation for good governance and order – can only be explained by hypothesizing a well-functioning administration that kept Sparta’s institutions operating. This logical conclusion is supported by various sources which make oblique reference to ill-defined dignitaries that evidently supported the known institutions of the Spartan state. For example, the Paidonomos and his assistants, priests, “magistrates,” and “heralds.” While there is no explicit evidence (except with respect to the Paidonomos) that these positions were filled by Spartiates, it is unlikely that the Spartans would have entrusted the education of their children, their relationship with the Gods, communication with the enemy or the enforcement of their laws to perioikoi, much less helots. In short, there were many tasks and responsibilities in addition to soldiering that must have been performed by full-citizens after they went off active duty. Let’s start with the agoge. Although Xenophon and others speak only of “the” Paidagogos, as if one man alone controlled the entire agoge, such a notion is illogical. 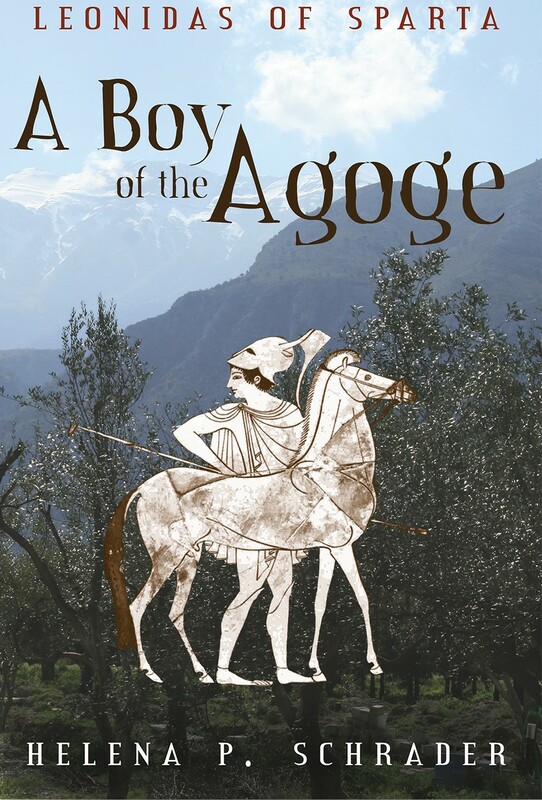 We know that effective education requires low ratios of instructors to pupils, and even taking into account an age cohort of eirenes providing a degree of internal discipline each year, it is not credible that there were no other agoge officials. It is far more likely, given the size and importance of the agoge to Spartan society, that there was a relatively large college of instructors, or at least Deputy and Assistant Paidagogoi, maybe the Mastigophoroi. Admittedly, these are usually portrayed as a bunch of whip-wielding thugs, but it is more probable, given the complexity of Spartan education, that they were responsible and respected educators. Then there is the issue of taxation. Taxation was particularly important in Sparta because citizenship itself depended on paying two kinds of tax: the agoge fees when immature, and the syssitia fees after attaining citizenship. Someone had to keep track of who paid how much, and they had to do that each and every month. Maybe each syssitia had a part time “treasurer” to keep track of fees, but the agoge was large and would have required at least one (and probably more) full-time “treasurers.” It is not credible that perioikoi would have been entrusted with control of records that revealed (and in part determined) the strength of the citizen body and so the army in future generations. Once taxes were collected, they had to be put to work, so we come next to the business of financial management. Sparta would have needed some mechanism to allocate funding to various state expenditures. Money was needed for the army, of course, but also for the fleet, and for public works like roads and fountains and drainage systems and for public buildings from temples to theaters, and monuments to barracks. Managing such projects requires full-time public servants committed to ensuring that the intentions of the state (as expressed, one assumes, by the Assembly via the ephors) are fulfilled and that funds are not allocated incorrectly. 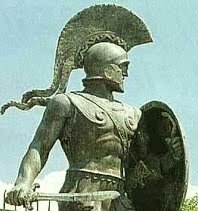 Sparta Through Persian Eyes - An Excerpt from "A Heroic King"
At the start of the month I speculated on the way Sparta might have looked in Leonidas' time. This is another way of looking at Sparta, this time through the eyes of a Persian interpreter, used to the great, walled cities, magnificent palaces and planned gardens of the Persian empire. "And this is it?" The Persian interpreter Zopyrus asked incredulously. "This is Sparta?" He looked around, baffled, as his chariot drew up in front of a modest, whitewashed building with a sober portico on a pleasant, but far from grandiose, square." Traveling in easy stages, it had taken four months to reach their destination, and Zorypus had been looking forward to staying in one place for a month or more. Now that he was here, however, he found Sparta so disappointing that he was no longer certain he wanted to stay for long. There was no denying that the capital of Lacedaemon lay in beautiful surroundings. It sat cupped in the hands of a fertile valley enclosed on three sides by mountains. The majestic peaks of Taygetos rose up to the west, and the Parnon range provided protection to the east. The two ranges met in the north so that as the Persian convoy worked its way up from the port of Gytheon on the Gulf of Laconia toward the city, the valley narrowed more and more. But Sparta itself made no sense to Zopyrus. Throughout the rest of the known world, cities were surrounded by massive walls. In the more primitive countries, these might be little more than mounds of earth surrounded by ditches, but in the more civilized parts of the world, the walls were of quarried stone and fired brick. Major cities often had walls twenty yards thick and fifty yards high, strengthened with towers that stood even higher, and many walls nowadays were faced with polished stone or glazed tiles. While more prosperous cities spread beyond their walls, so that dwellings, stalls, shops and other semi-urban structures cluttered the surrounding countryside in ever greater density, all the important civic buildings and palaces of every metropolis Zopryus had seen up to now lay behind defensible walls with ramparts and fortified gates manned by soldiers. Sparta was different. It had hundreds of temples, shrines, monuments and public buildings. It had fountains, broad avenues, gynasiums and palaestra, stoas and baths, and an amphitheater below the acropolis. It was undoubtedly urban, but because it had no walls, it seemed to sprawl across the plain as if some giant had spilled a basket full of buildings. It was haphazard. There was no urban planning. There was no gridwork of streets running at right angles to one another, and there was no logical organization into quarters for administration, trade, worship, finance and dwelling. There wasn't even any separation of rich and poor. Furthermore, the royal palaces were primitive. Rather than sitting above the city surrounded by gardens fed by streams and encased in high, glistening walls, they were located right in the heart of the city, crowded by other buildings that had grown up around them over time. They were too cramped to be comfortable or have pretty grounds, and they were completely indefensible. For example, in his best-selling novel Gates of Fire, Stephen Pressfield calls Sparta “a village” adding: “The whole stinking place would fit, with room to spare, within His Majesty’s [Xerxes of Persia’s] strolling garden at Persepolis. It is … a pile of stones. It contains no temples or treasures of note, no gold; it is a barnyard of leeks and onions, with soil so thin a man may kick through it with one strike of the foot.” (p.188). Modern writers are often guilty of both a too hasty reading of Thucydides, and a failure to consider other evidence. Thucydides complains that Sparta “is not regularly planned” – but then nor is London. And he says it is “simply a collection of villages, in the ancient Hellenic way.” This is not the same thing as saying Sparta was not a cosmopolitan city, it only means that Sparta had no plan and no walls and hence grew haphazardly -- as all major European cities did after their confining medieval walls were torn down. No one today would call Paris, Berlin or Rome “a collection of villages” simply because they are in fact many villages which have grown into a single metropolis after the need for fortifications disappeared and economic growth fueled urbanization. Why should we assume that just because Sparta was made up of five distinct villages in pre-Archaic times that it was not – in its years of glory – a cohesive, dynamic city? Nevertheless, what has come to light demonstrates definitively that far from being a place full of primitive, mud structures, Spartan architecture was substantial, monumental (not the same as “magnificent”! ), and very, very typical of Doric architecture throughout the ancient world. Sparta was, in fact, the ultimate Doric power. It attained it greatest artistic flourishing in the 6th rather than the 5th century BC, and consequently its greatest monuments were archaic not classical or Hellenistic. But they existed! We can still see some of the foundations and remnants to this day. Sparta was not just a heap of peasant hits, as Pressfield and other modern novelists would like us to believe. I would also like to point out that no Spartan has left a written description of his/her city that has survived to our time. Would a Spartan have found the Acropolis in Athens “magnificent” or simply “distant, intellectual and arrogant”? Would a Spartan necessarily have admired the altar at Pergamon? Or found it “gaudy” and “busy”-- as many people see rococo architecture today? Sparta was different from other cities of its age, particularly Athens. Does that necessarily mean it was less attractive? The Sparta of my novels is this attractive city rather than the "stinking village" of Pressfield.